UDM Downloads > PhotoOne Recovery! PhotoOne Recovery is an easy-to-use and powerful image recovery software designed exclusively for digital camera users. PhotoOne Recovery recovers deleted, formatted and lost digital photos, images and pictures from almost any types of media cards used by digital cameras. PhotoOne Recovery is the first and only image recovery product to allow preview image in original size and allow save ALL of the found images in a trial version. You can enjoy the full features of PhotoOne Recovery in a trial version before you purchase a license key. 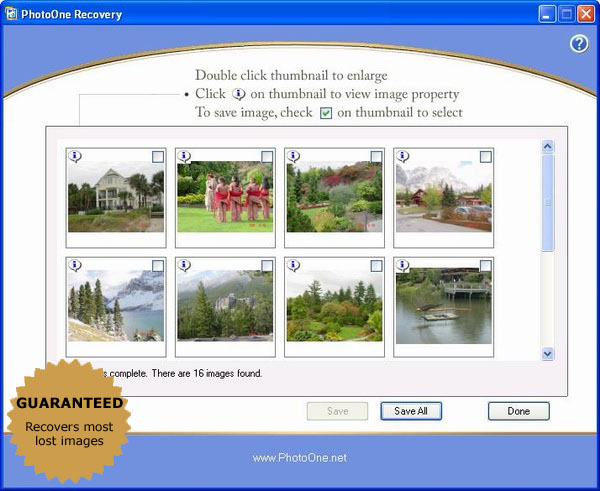 PhotoOne Recovery guarantees to recover most lost images from any digital camera. Using advanced SmartRecover Technology, PhotoOne Recovery can recover images that other recovery software may not find. If images were deleted or formatted in a digital camera or a computer, or if the media is corrupted and not recognized by Windows, PhotoOne Recovery can find lost images back for you. PhotoOne Recovery works with any type of digital card reader. PhotoOne Recovery also works with direct camera connections where your camera appearing as a drive letter in your local computer. Common media types that PhotoOne Recovery supports include SmartMedia, CompactFlash, Memory Stick, MicroDrive, xD Picture Card, PC Card, Multimedia Card, Secure Digital Card, floppy disks, and other medias. Using PhotoOne Recovery is risk-free. PhotoOne Recovery does not write data to your original disks. Instead, the program only reads data from your media card to recover images. PhotoOne Recovery also allows a user to create a backup disk image file, or recover lost images from a disk image file. A digital camera user can create a disk image of the media drive, and keep the media drive at a safe place. PhotoOne Recovery can recover lost images from a disk image file without touching your original disk drives.